My preference for the type of hotel I stay in when I go on vacation has changed over the years. Back in the courtship days, we were trying to scrimp and save and since holidays usually mean sightseeing in the day and partying at night, we chose to go for budget hotels because all we needed was a bed to crash out. 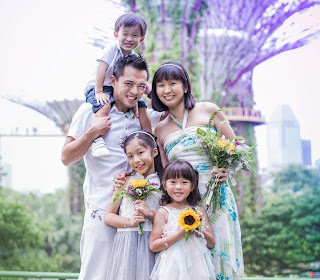 When the kids came along one by one and our living standards gradually improved, we grew inclined towards family-friendly hotels that are cosy, accessible, spacious and more than just decent. 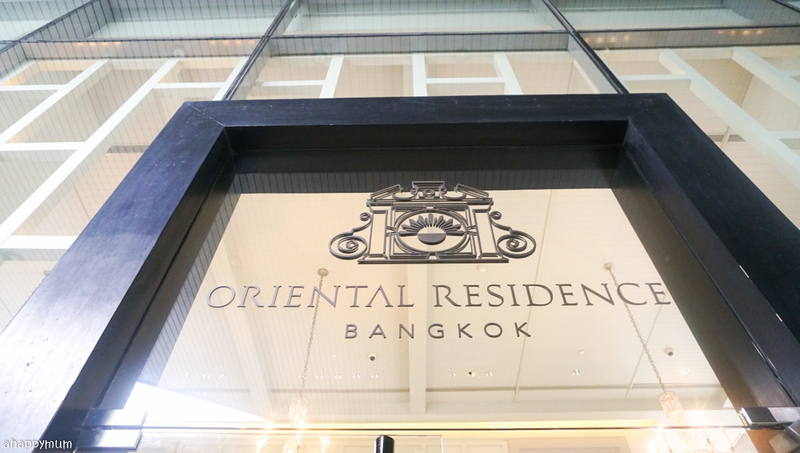 On our recent trip to Bangkok, we stayed in Oriental Residence which seamlessly integrates luxury, elegance and comfort - in a way that won't cause you to burn a hole in your pocket when you choose to stay here. 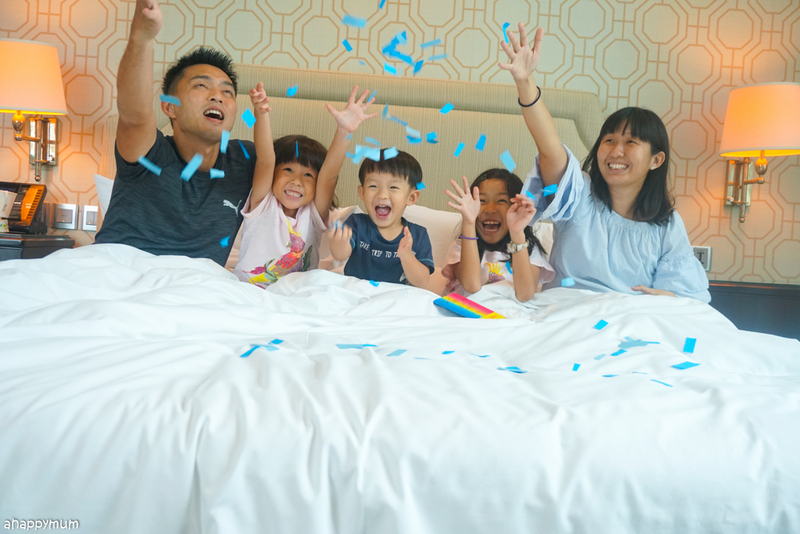 This being our first holiday with kids to the beautiful capital of Thailand, we were thankful to get to stay in the lavish two-bedroom suite which spans an impressive floor area of 120sqm, making it perfect for travelling families. More than just a hotel, it made us feel that we were living in a home away from home - and quite a luxury one, I must say. 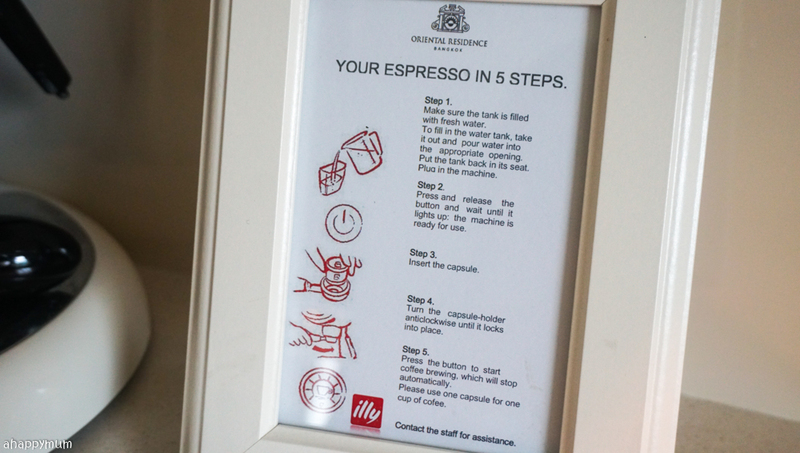 In this post, I will share with you more about our accommodation at Oriental Residence and why it is one of our favourite highlights from the trip. 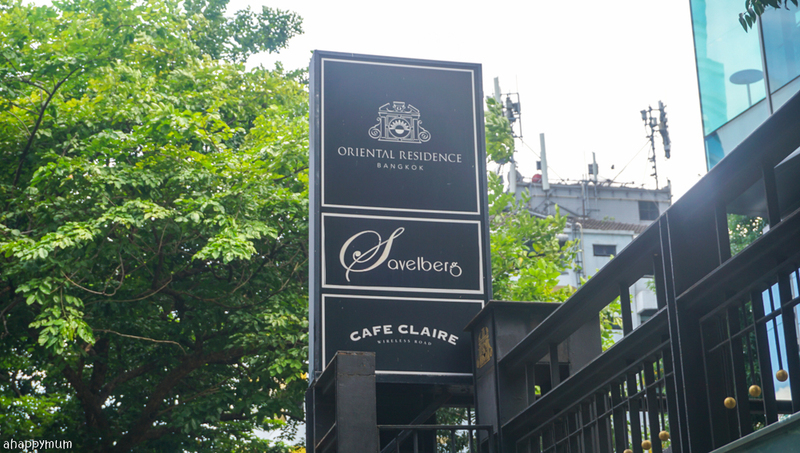 Situated on Wireless Road alongside a whole stretch of embassies, Oriental Residence is just a 10-minute walk away from Ploen Chit BTS Station. The station and the hotel are located on the same road so you can be sure that you won't lose your way. For those who prefer not to walk, the hotel also offers complimentary shuttle service to Chidlom BTS Station. 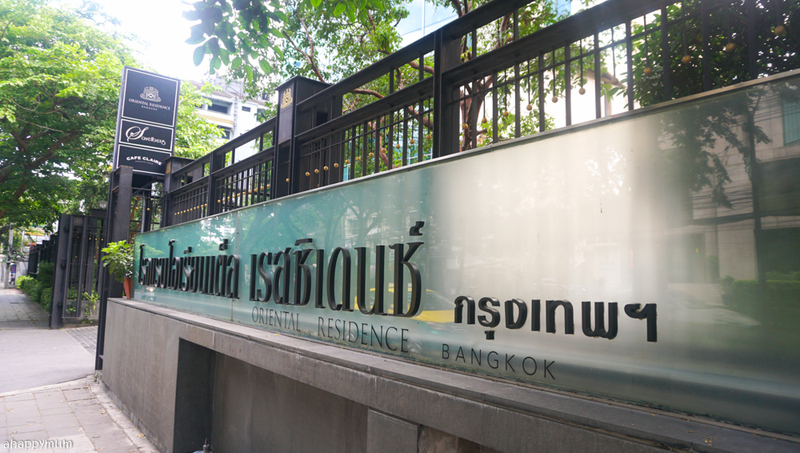 Getting around via the BTS is very convenient and Ploen Chit station is just two stops away from the bustling Siam Station where many tourist attractions - including Kidzania and Sea Life Bangkok - are located (Chidlom is one stop away). If you are taking a cab back in the middle of the night, chances are it can be a little tougher to spot the hotel, especially if the driver is unsure of the location. I have to say that the hotel name (in English) is not very prominent at the main entrance so you have to keep a close eye when nearing. Look out for the Netherlands Embassy which is right next to the hotel and get a hotel name card from the reception to keep in your pocket just in case. 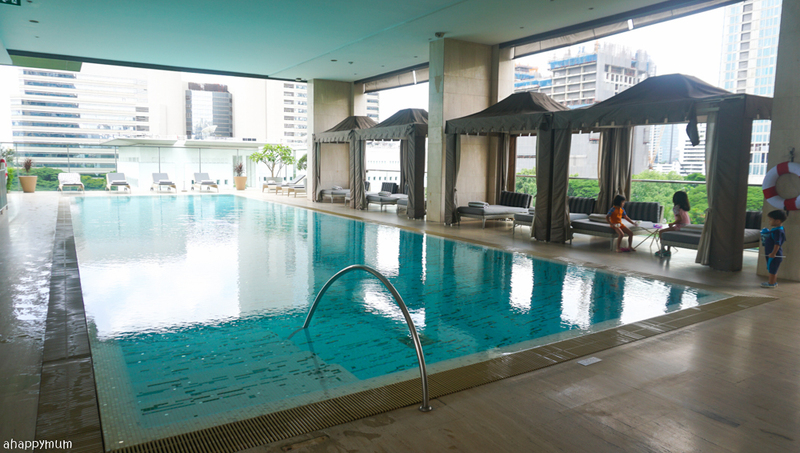 It takes just over half an hour's drive to get here by either DMK or Suvarnabhumi airport and if you are willing to spare the extra cash, you can even arrange for an airport transfer via an indulgent BMW 5 Series. 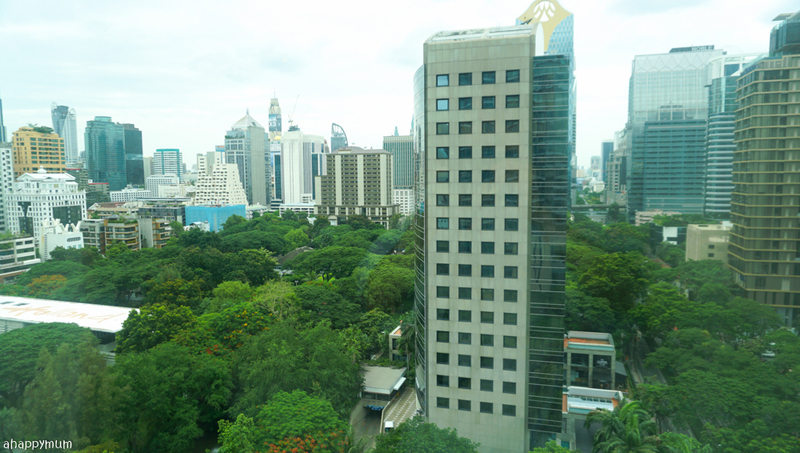 Towering at 32 storeys high, Oriental Residence overlooks most of the other buildings in the vicinity. 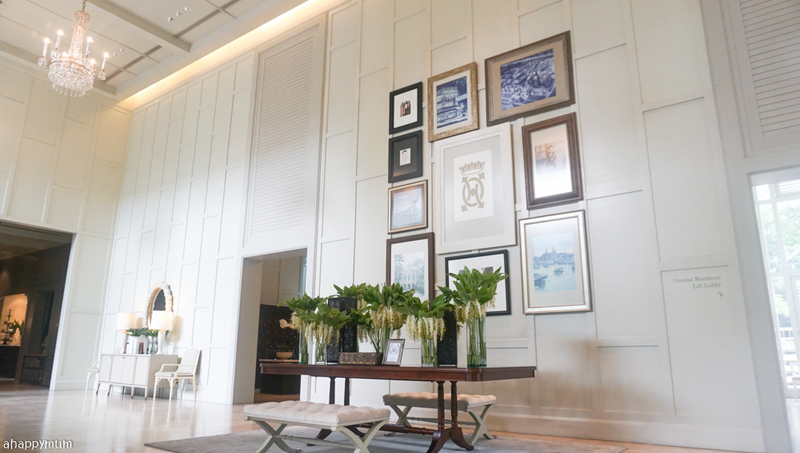 The moment we stepped in, we were greeted by the modern elegance and grand opulence of the high ceiling, fresh blooms and glistening white marble in the hotel lobby. 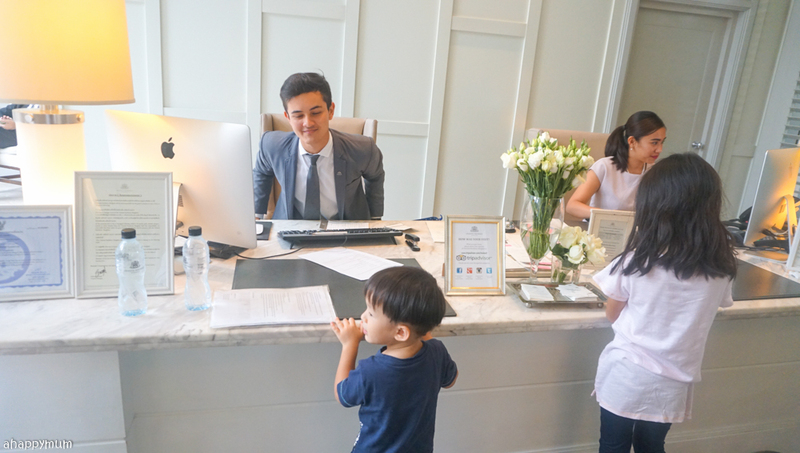 We were attended to by the friendly receptionists who gave us a warm welcome and swiftly helped us to check into our suite. 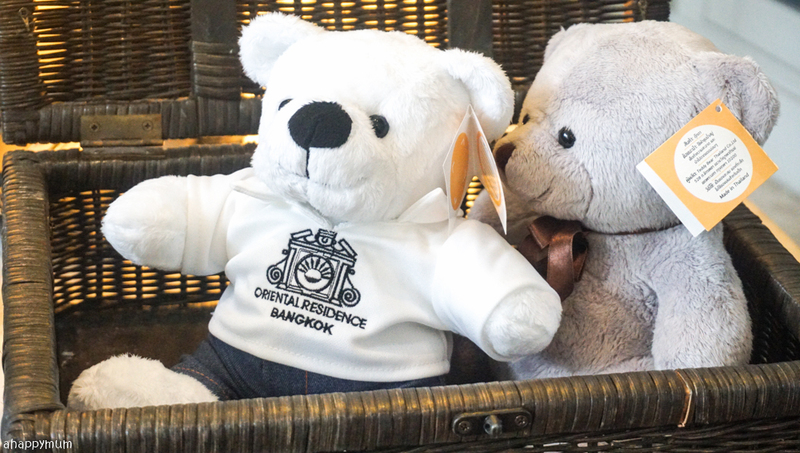 There were these adorable teddy bears sitting on the reception desk and we were informed that guests could purchase them and all proceeds would be donated for a good cause - Freeland's "Surviving Together" program which strives to protect and conserve our biodiversity. 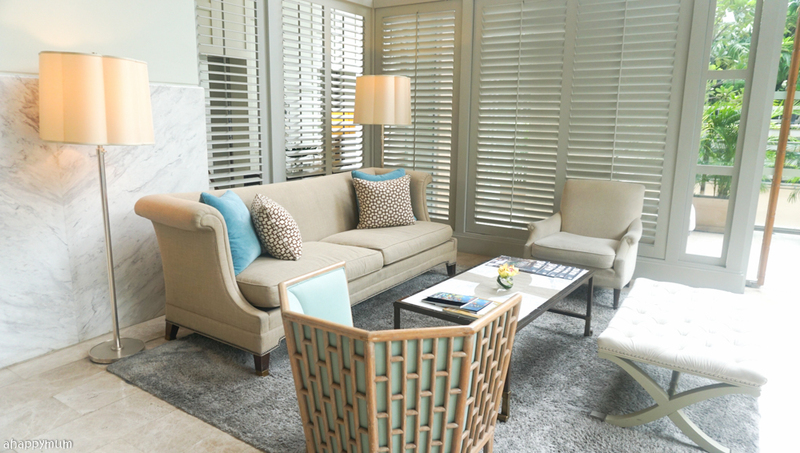 What grabbed my attention most at the lobby was this lounge area which looked so comfy and cosy! 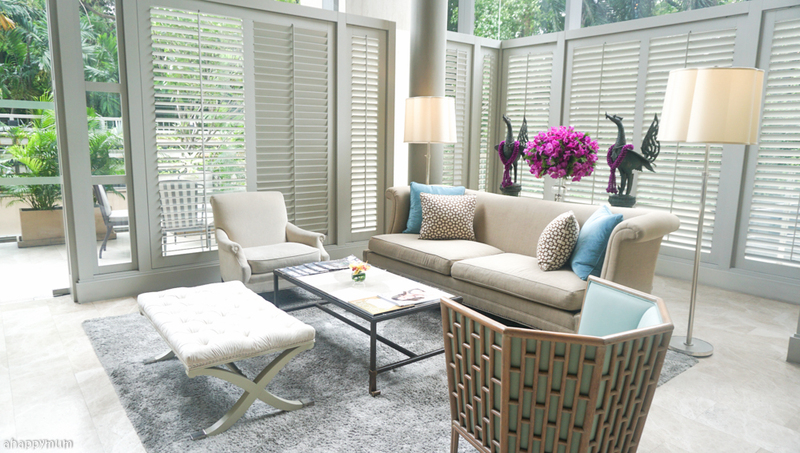 I love the turquoise cushions, the pretty purple blooms and the chic looking grey rug. There is also a small porch outside for guests who needs a breath of fresh air too. 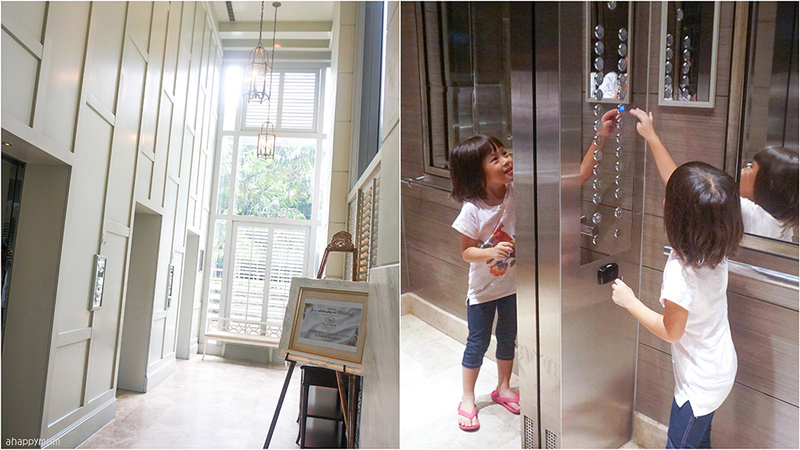 The lift lobby is not as wide or as lavishly decorated as one might expect from a five-star hotel but the tall ceiling helps to retain the grandeur and the marble walls give it a clean, minimalist look. 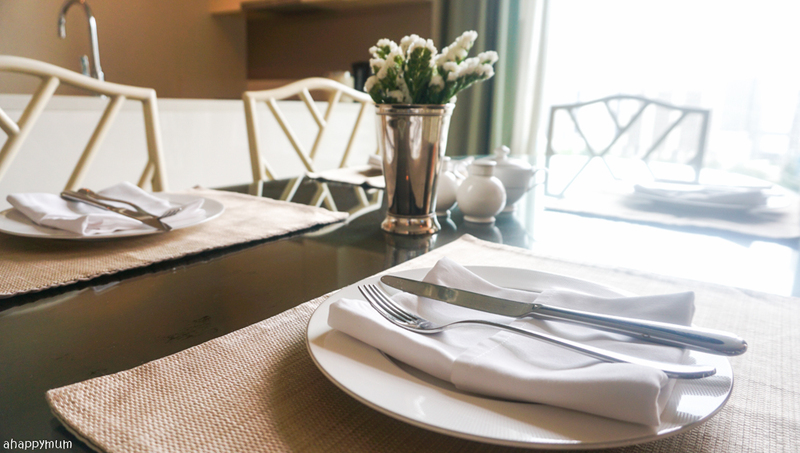 With a total of 145 rooms and suites - Deluxe Room, One-Bedroom, Two-Bedroom and Three-Bedroom suites, Oriental Residence offers luxury serviced residences in the heart of the city. 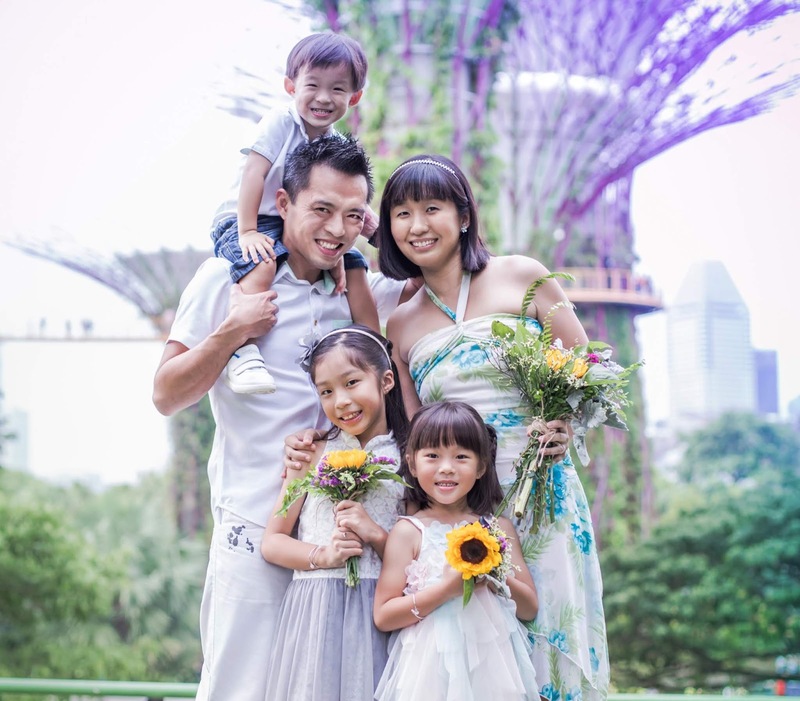 It used to be that majority of the guests were visitors who were here on long term stays but in recent years, they have also seen a dramatic increase in the number of people who come here on a short term basis and only bunk in for a couple of nights. 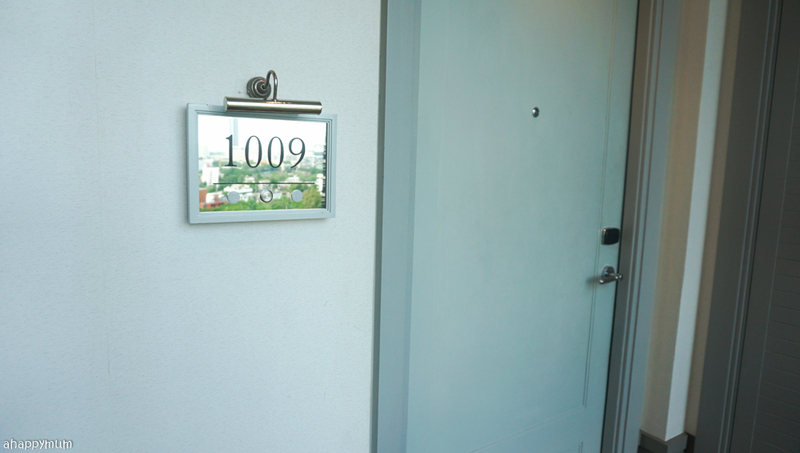 I'll be taking you on a tour around our two-bedroom suite and first and foremost, let me just say that it is bigger than my house! 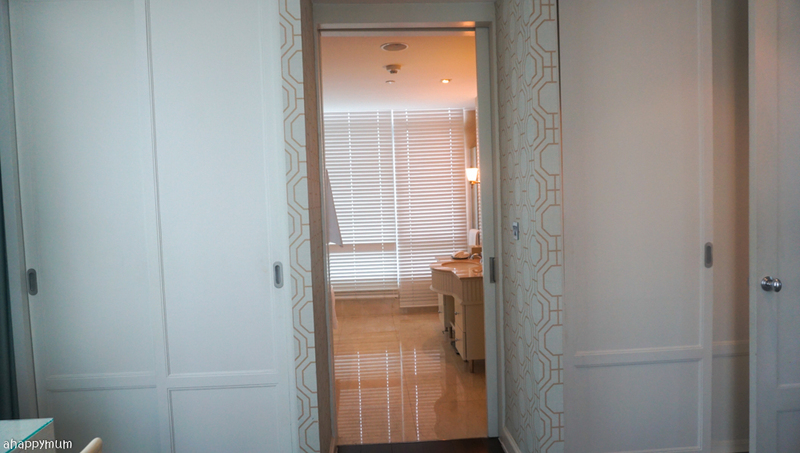 Yes, the size of the suite was more than what we expected and when I said I would like my kids to have some space to move around without falling over, guess what, they could play hide and seek here and not run out of places to hide after umpteen rounds. 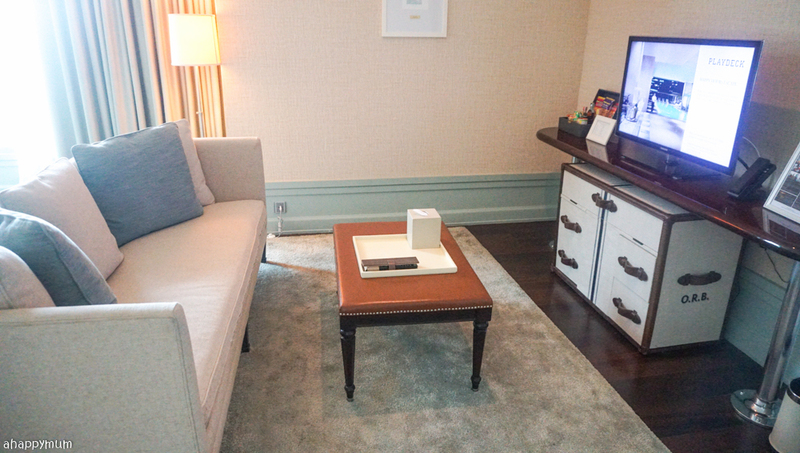 Firstly, check out the living room! I simply adored the colour palette - cream, blue, brown, turquoise - because there are my favourite colours and they made the suite feel extra cosy for me. 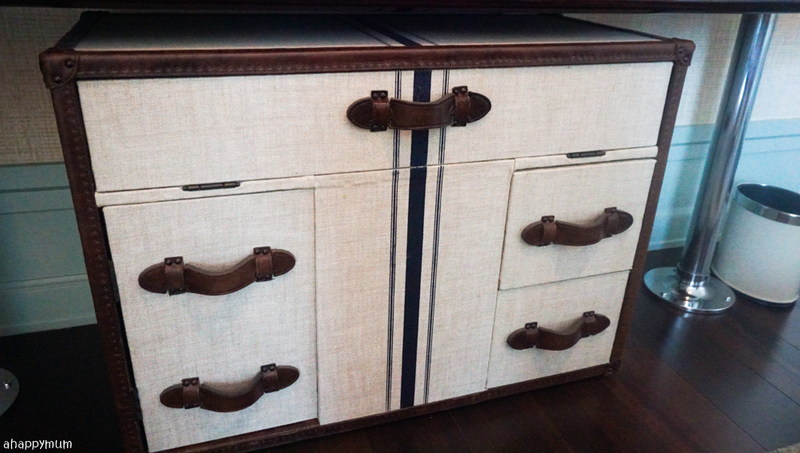 For the flooring, it comes with hardwood and thick rugs which makes the place resemble a home even more. The fabric sofa in the living area was soft and comfy (I don't like hard ones, do you?) and we were stoked to hear Taiwanese singer A-Lin performing at a concert when we were switching through the channels. The hubby was also happy to have this chill out corner to watch his football matches when the kids were asleep. 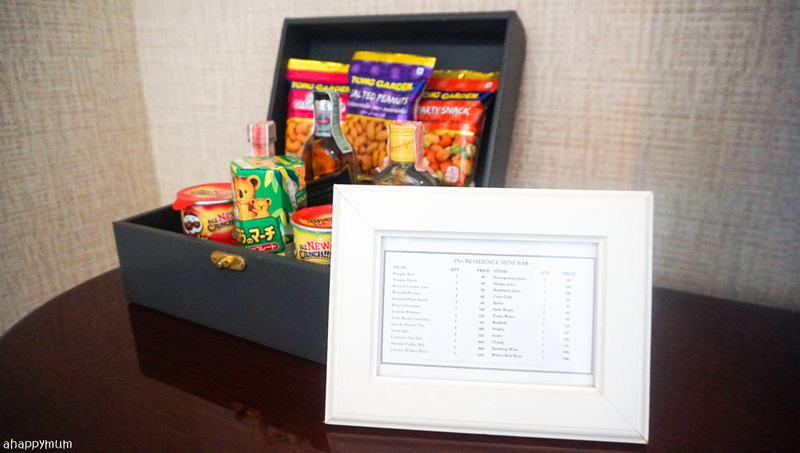 Everything in the room was clearly labelled, from the snacks list to the TV directory. We were looking through the drawers and the hubby was impressed to find this box that came with pretty much all the cables and adaptors that you might require during your stay. 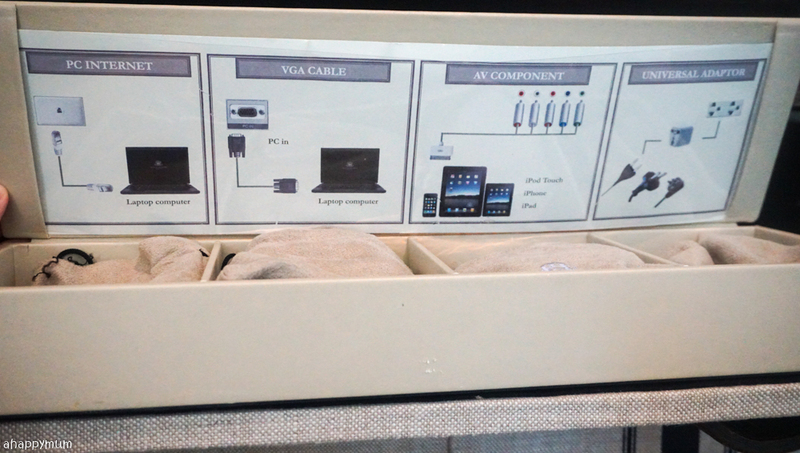 Oh by the way, there are also three-pin sockets in the master bedroom so you can directly plug your phones or laptops in without the need for an adaptor. 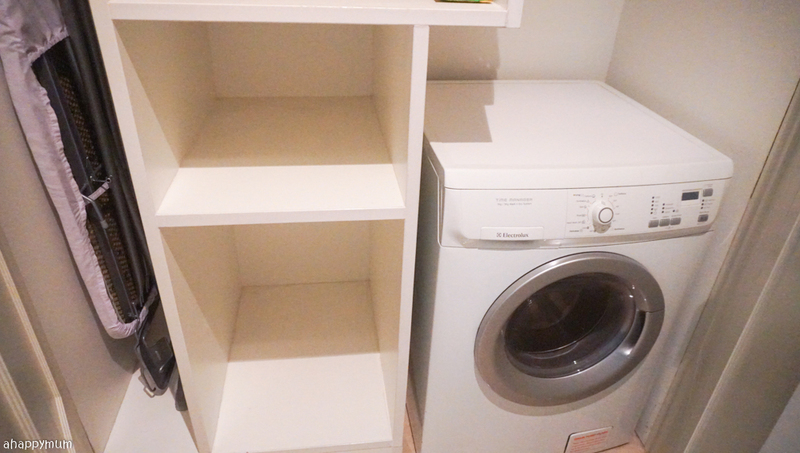 Moving on, you can also find a laundry area near the main entrance and it comes equipped with ironing equipment and a washer dryer. I must tell you, the hubby and I just started the habit of washing our clothes during a vacation whenever we come across a washer dryer. We didn't use to do it because we would just throw all our dirty clothes into one luggage and lug it all home, only to realise that we had loads and loads of washing to do - it's something very real when you have three kids who can somehow wear a dozen sets of clothes a day between them. So nowadays, we try to do the washing whenever we can and it really saves a lot of hassle when we get home. 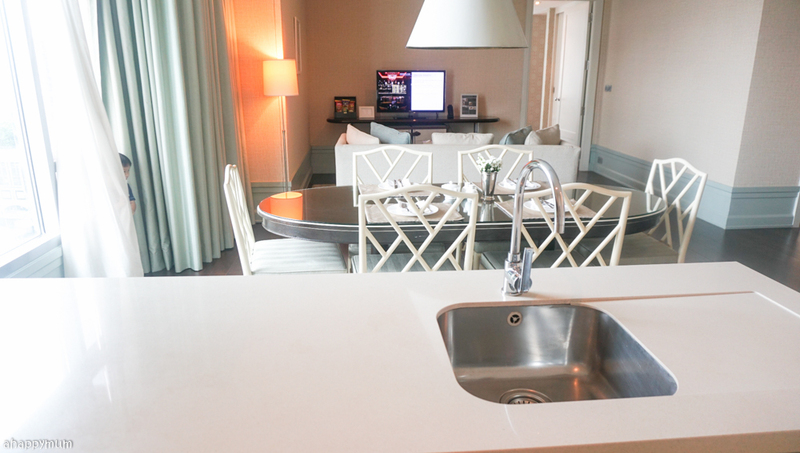 Besides a dining area which can comfortably sit a family of six, we also have a fully equipped kitchen in the suite! 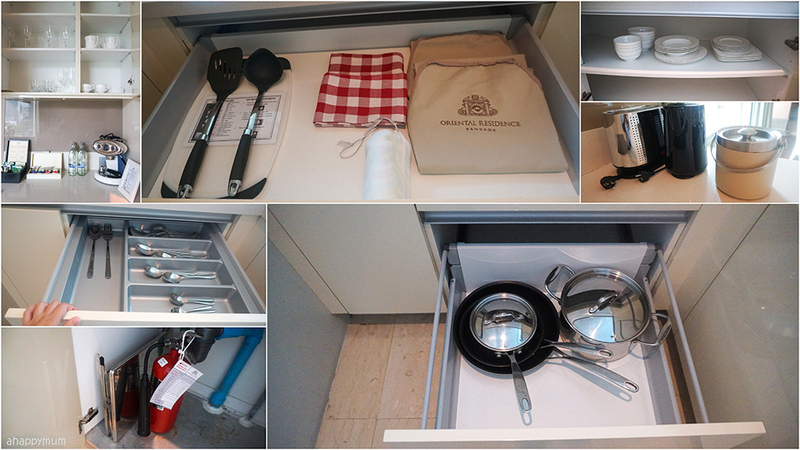 Yes, it's not just a pantry or a kitchenette but one that you can whip up three-course meals in because you have everything in need (other than the groceries, of course). The hubby was very impressed by how the kitchen came with everything he could think of and I was just amazed by the sheer size of it because most kitchens I've been in are much more cramped and have less space to maneuver. 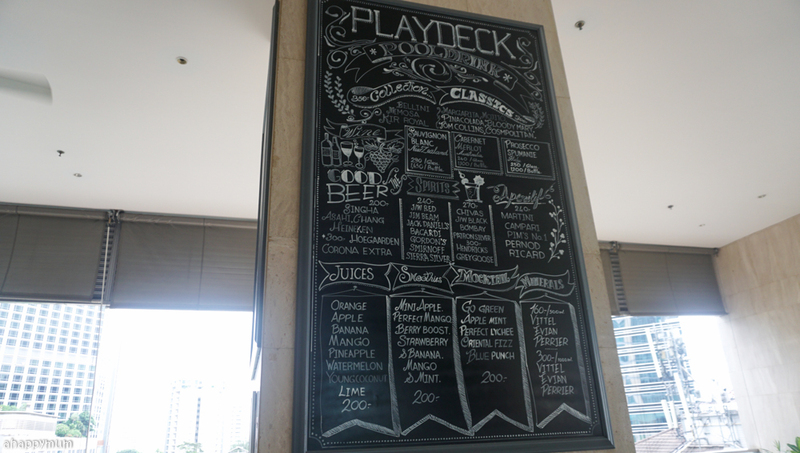 The fridge is stocked up with juices, fizzy drinks and beer too if you would like to quench your thirst. 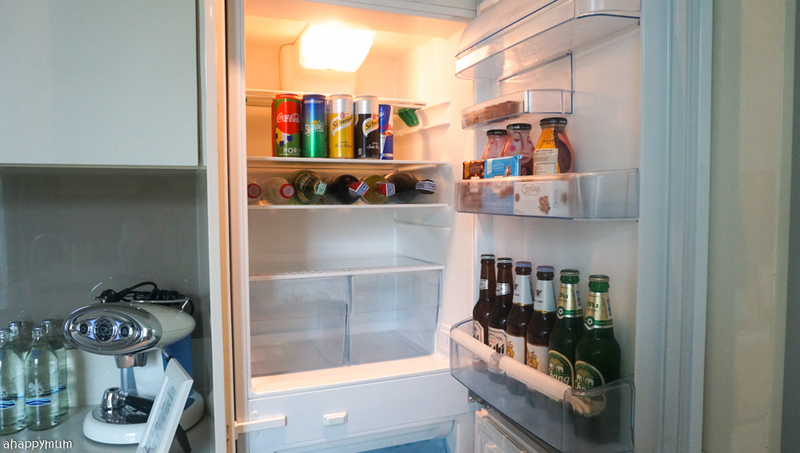 And, it's not just a tiny bar fridge but a huge double compartment fridge. Talking about thirst, it will be easy to keep yourself and the kids hydrated because there will be ample complimentary water bottles around the suite. 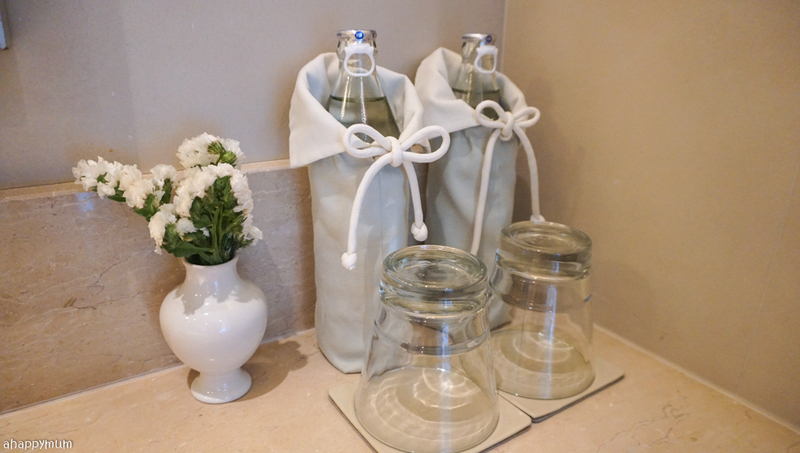 Unlike the plastic bottles that you see in most hotels, Oriental Residences make it more classy and at the same time eco-friendly by using glass bottles instead! 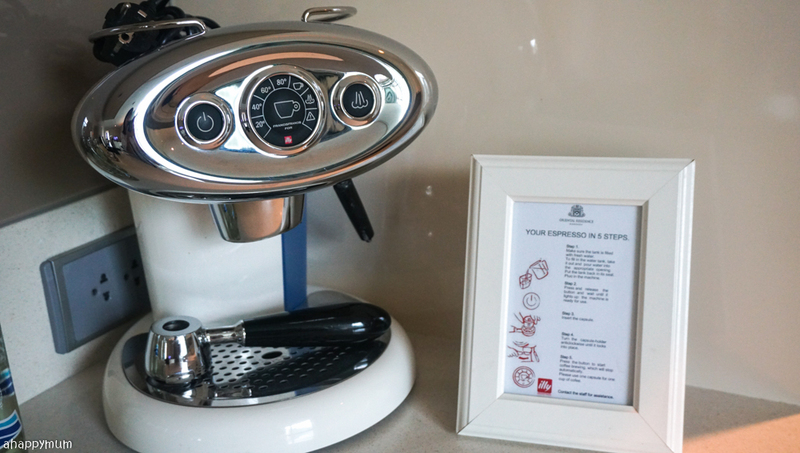 For the coffee lovers, you'll also be happy to know that there is an Espresso machine in the kitchen that comes with the capsules and a step-by-step instructions for you to follow. 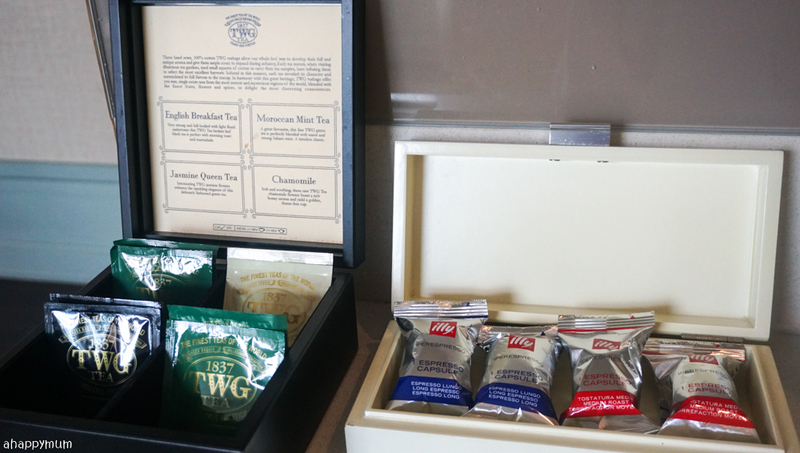 As for the tea lovers, how often is it that you can find your TWG tea - one of the finest luxury tea brands - in your hotel room? Next, let's take a look at the bedrooms! 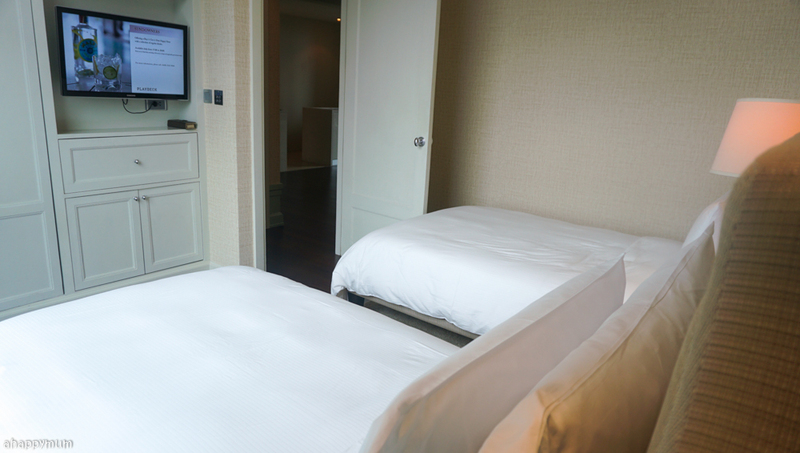 Yes, we have not one but two bedrooms in this suite and the girls were excited to get their own room to sleep in this time round. What? 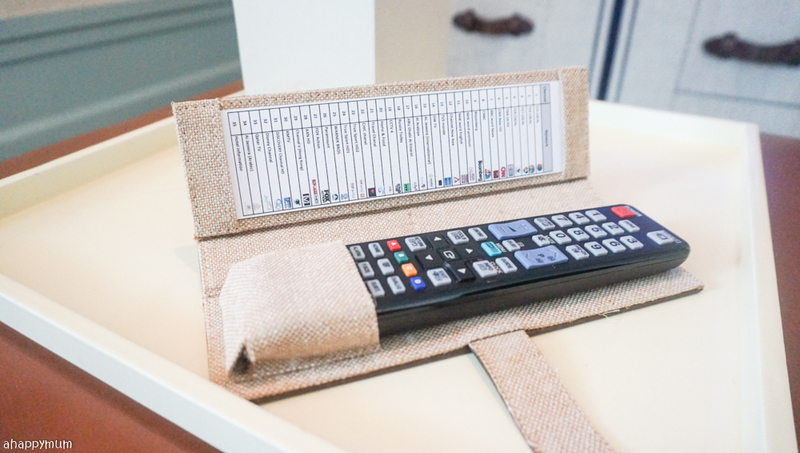 They even get their own TV too? Yes, that means Mama doesn't need to watch cartoons at night but can tune in to HBO or Fox movies while they watch the kiddy stuff that they love. Woohoo! It's a holiday for everyone after all, right? The bedroom comes with two single beds and the toilet is just right outside, which makes it really convenient when they have to wake up at night. My girls usually kick and flip aplenty when they sleep and I was really worried that they would fall off the bed, thus I used some of the extra pillows and cushions to surround them. It turned out that they said the beds were so comfy and nice to sleep in that both of them had a good night's rest and neither of them fell off. Yay! 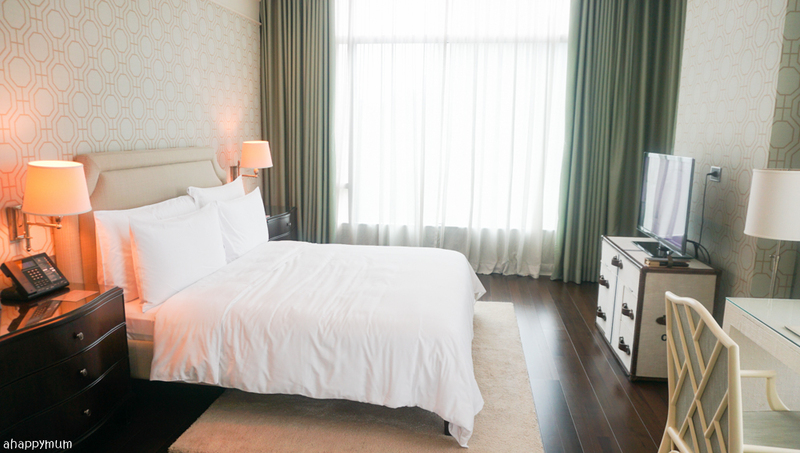 As for the master bedroom, the first thing that caught my eye was the green curtains which reminded me of what we used to have at home since it is my favourite colour. 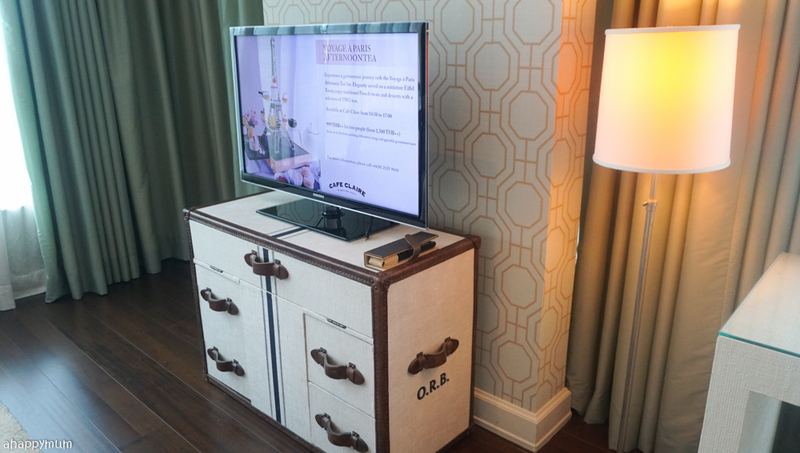 The geometric wall paper, wooden flooring, relaxing warm lighting and and the vintage TV cabinet with leather handles combined together to give the room a very welcoming feel and I felt instantly at ease when I stepped in. 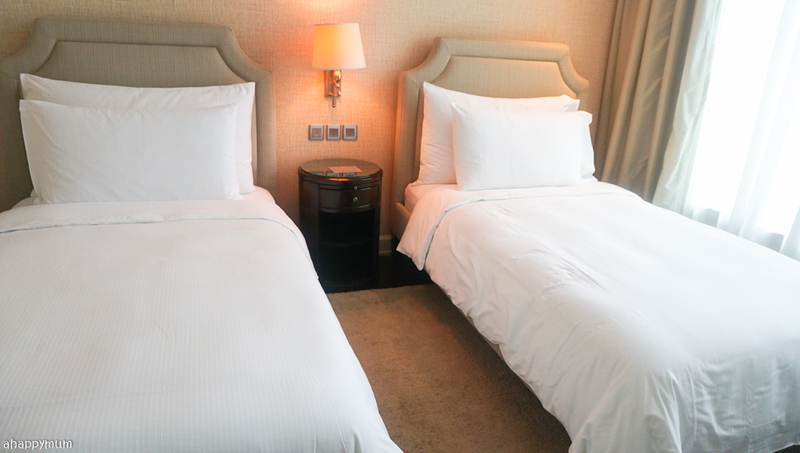 It was also assuring to see that the hotel staff had taken the effort to set up a baby cot for us in the master bedroom - whether or not the boy sleeps in it ultimately is another question. Other baby amenities such as bath and shampoo gel, powder, toilet bowl, bathtub and toys can also be obtained upon request. Lastly, let's have a look at the bathrooms and toilets. See this one below? 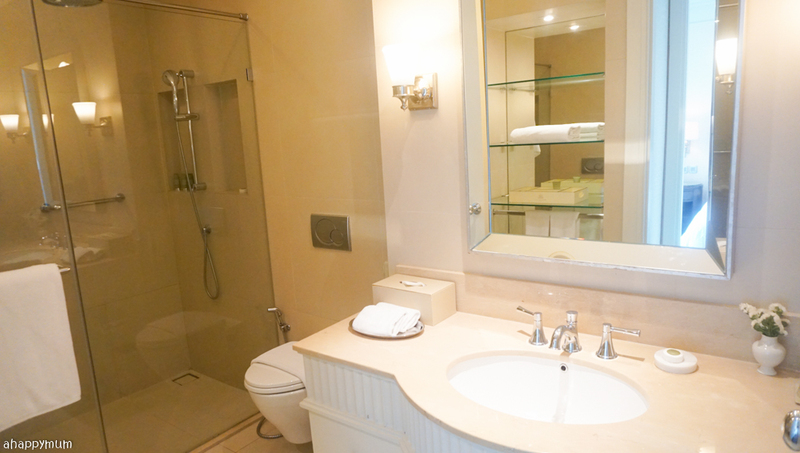 It looks more ordinary because this is the second toilet in the suite. I do love that it comes equipped with a rain shower and decent sized mirror though. But... wait till you see the main one in our room! 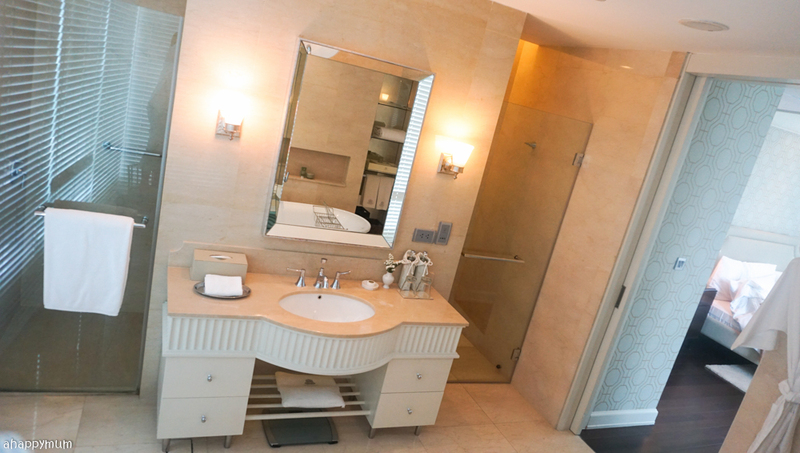 This has got to be the biggest, most grandiose hotel toilet we've ever had and not to exaggerate, it is easily the size of our master bedroom back in Singapore. 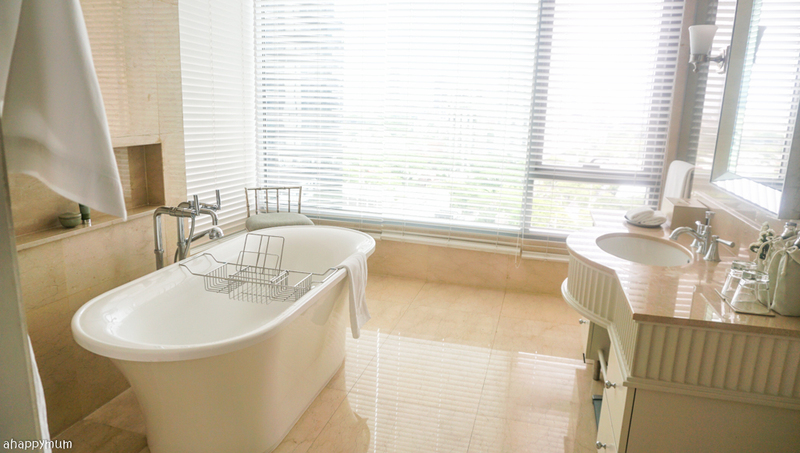 Firstly, check out that impressive standalone bathtub! It doesn't even need to be stuck to a wall because we had so much space for it and just that fact alone made taking a bath in it feel more of a luxury. For those who like to read or take a drink during your bath, the adjustable stand is pretty cool too. 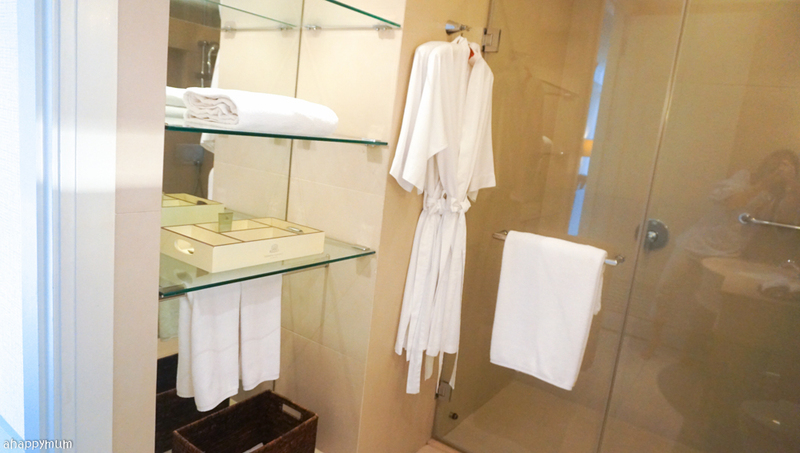 The bathrobes, towels, toiletries and laundry basket are neatly laid out so it's quite straightforward to find what you need. 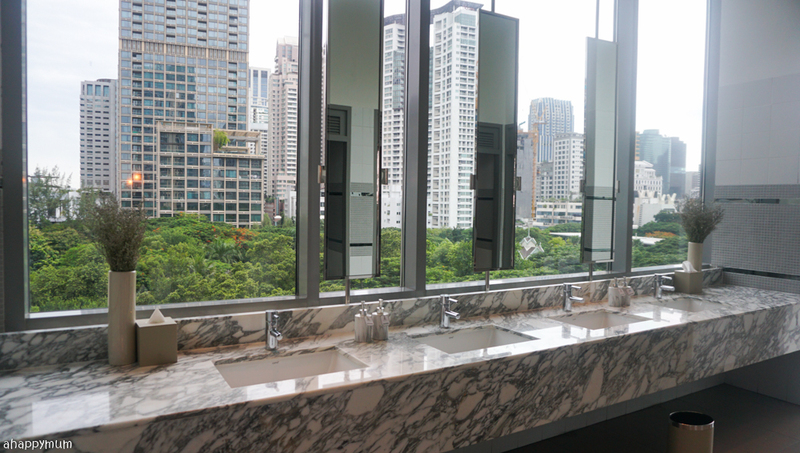 The shower and toilet areas come separately - one at each side of the basin, which is partly why the place feels so huge. Remember I mentioned about the glass bottles that come with drinking water for your use? Yup, they have these in the bathroom too and these are topped up frequently. There is also a weighing scale just in case you need it too - be it for yourself or to check your luggage weight after all that shopping. The kids couldn't get enough of their bath - they only get to do it in a tub when we are on holiday - and I love how the natural light shone in when the blinds were drawn. Well, it won't be long before these little ones don't get to bathe with one another anymore so these moments are truly precious for us. One other thing that impressed me was how I would find this motivational quote on my bed, along with a fresh orchid, the newspaper catalogue and breakfast menu at the end of each day. 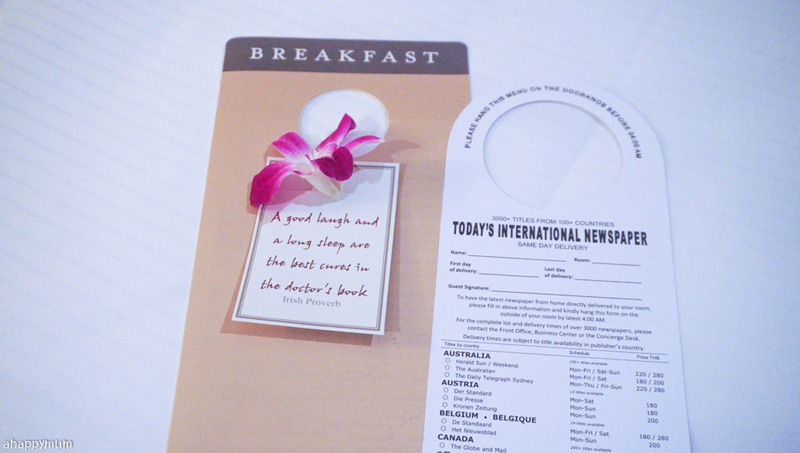 This one that said "A good laugh and a long sleep are the best cures in the doctor's book" was my personal favourite. Like I said at the start, we used to run outdoor quite often instead of staying to enjoy our hotel room but that has gradually changed over the years - especially when we end up in one that exceeds our expectations and feels so cosy that we would rather spend time relaxing in it as a family. Oriental Residences is definitely one of those and because of this impressive suite, we ended up spending a Sunday afternoon - which happened to be Father's Day - in it, doing nothing much but just enjoying each other's company. The kids presented Daddy with their gifts, including handmade cards, a cup trophy and lots of confetti which they had taken effort to make and pack into the luggage. 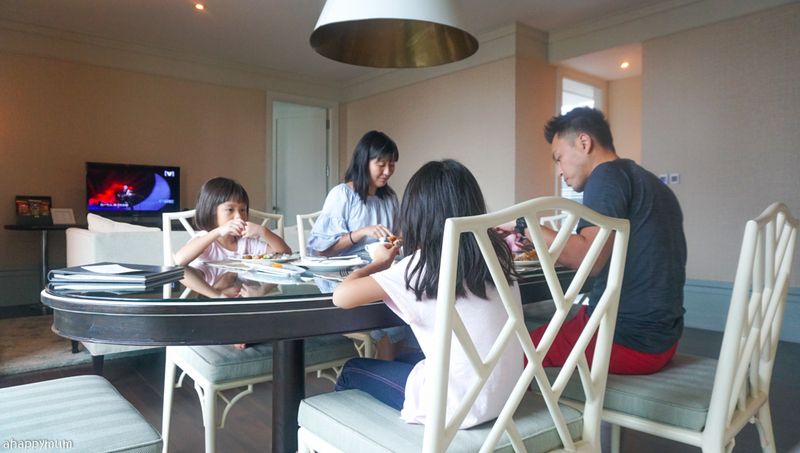 We let the kids take a nap, we watched TV, we ordered our lunch and enjoyed the suite a little longer before we headed out to explore the vicinity. 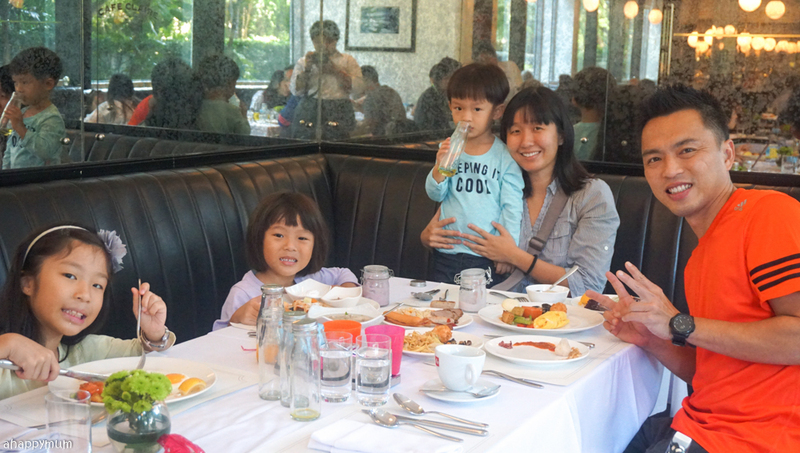 Admittedly, it felt nice to just take things slow and easy, and not feel like we have to run around every moment of every day to make the most of our holiday. While the toddler was taking his afternoon nap, the rest of us decided to order some food to our room for a quick bite. It was awesome to be able to enjoy this view of the city as we tucked in and we had a proper dining table (not a temporarily set up one) that came with table runners, plates, napkins and stainless steel cutlery to complete our dining experience. 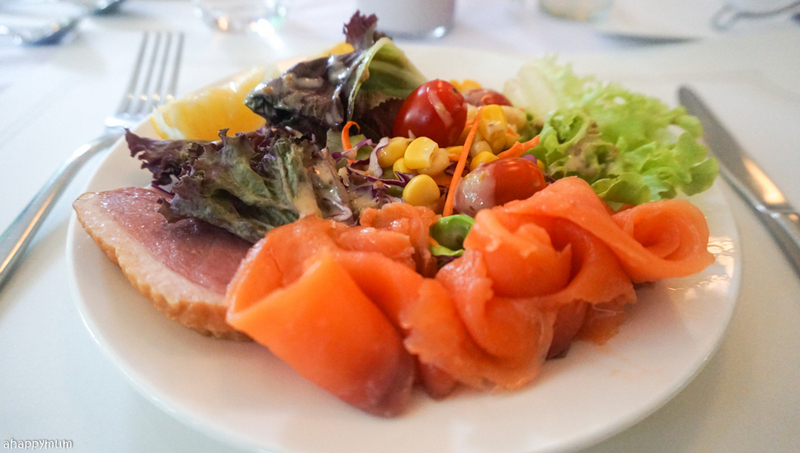 The menu was very comprehensive and offered a exceedingly wide variety of options for us to choose from - from appetisers to main dishes and from intercontinental to local fare. 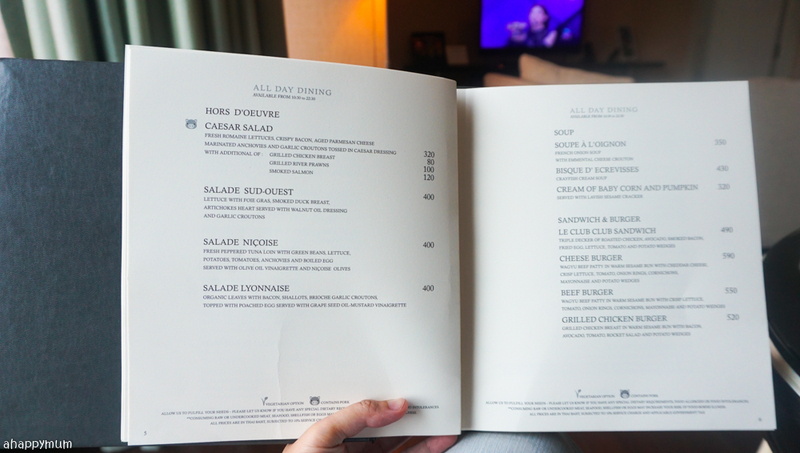 I must say that the price wasn't that cheap too but that was kind of expected and the damage to our pockets wasn't as great as some of the meals we had in our own luxury hotels back on the sunny island. 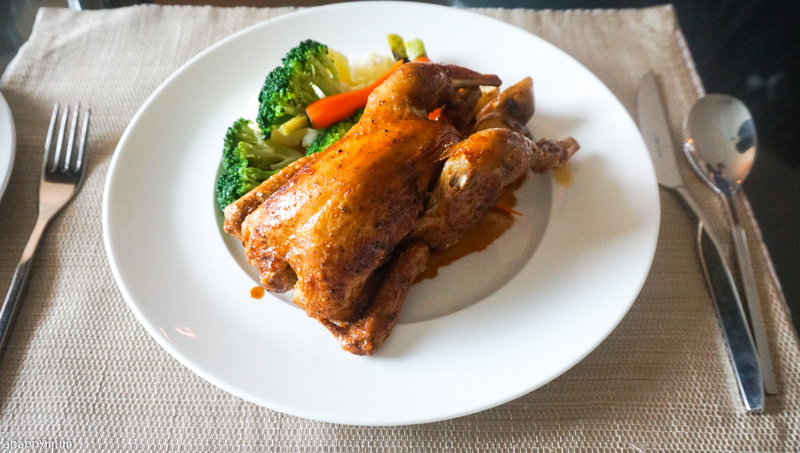 We ordered two dishes - Roasted Spring Chicken (550 baht) and Tom Yum Ghoong (400 baht) and both of them lived up to our expectations. 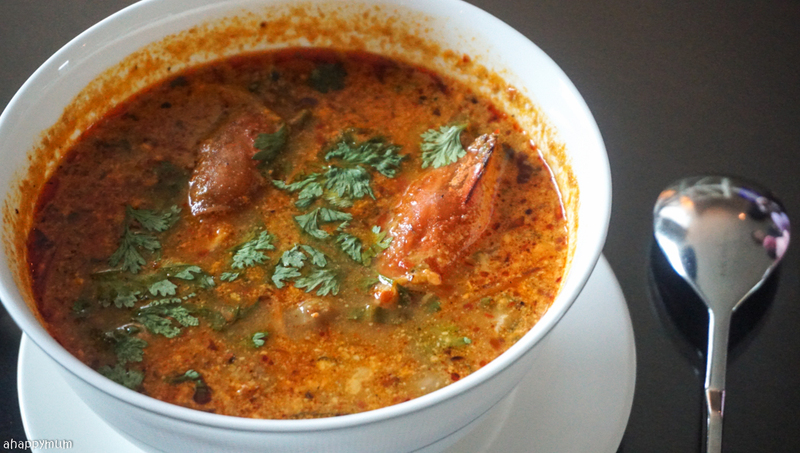 The chicken was cooked nicely though I would have preferred it to be a little more tender and the soup was bursting with flavour and contained more seafood than we could have bargained for. 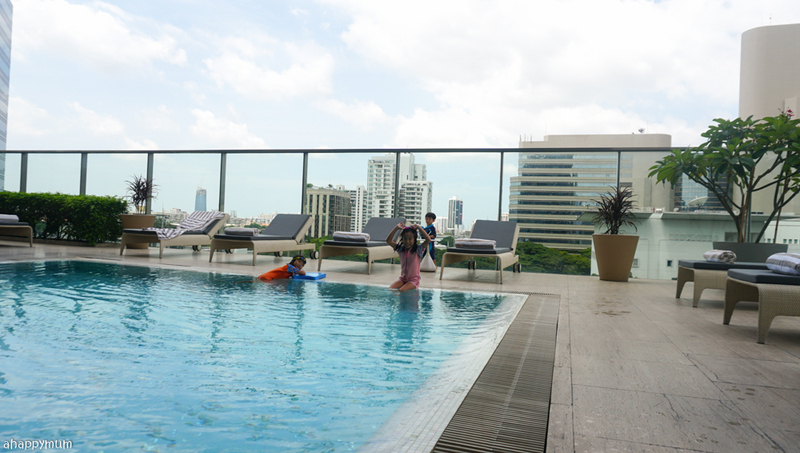 One of the facilities we have to check out when we stay at a hotel is.... the swimming pool! 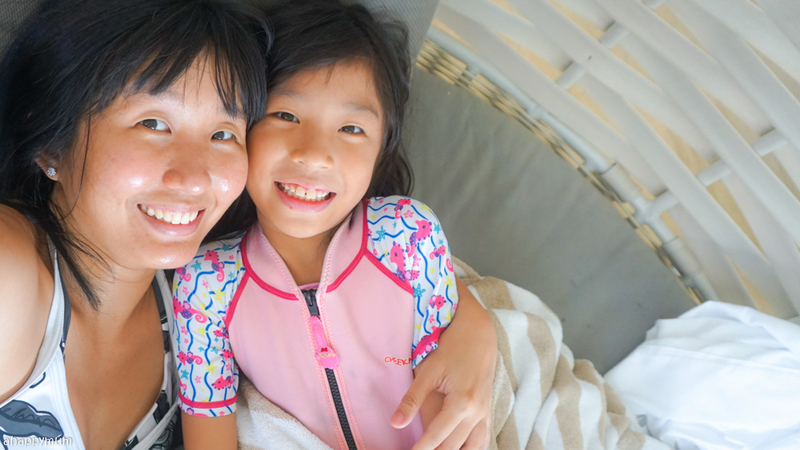 Yup, we always bring along our swimwear and the kids can never say no to a splashing fun session. I was very thankful that the hotel reception granted us a late checkout at 2pm since we had a late afternoon flight. 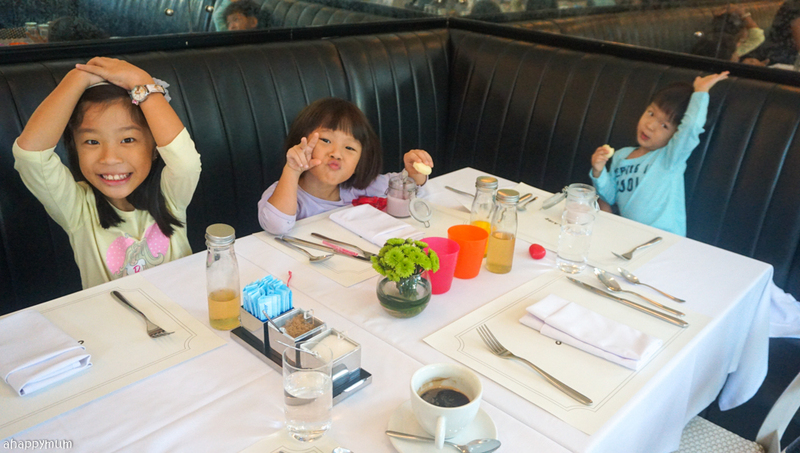 That gave us the whole morning to spend at the pool after having a hearty breakfast. 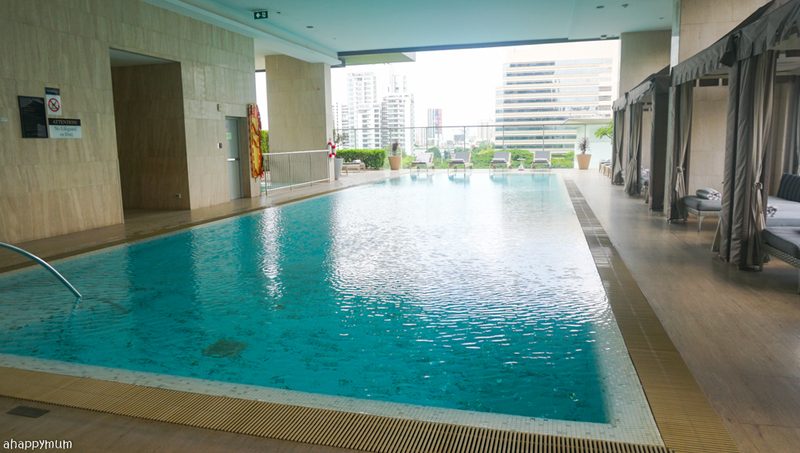 You know what I love best about the pool at Oriental Residence? It is semi-shaded! Yup, that means a good part of it is sheltered and therefore, we can come here to relax be it rain or shine and not have to worry about the scorching sun or wet weather. 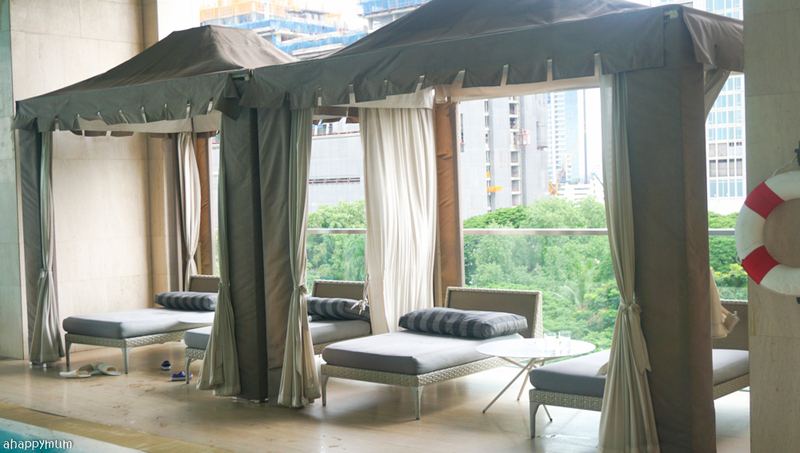 The cabanas that came with veils and the pool loungers with pillows were also a very welcoming sight. 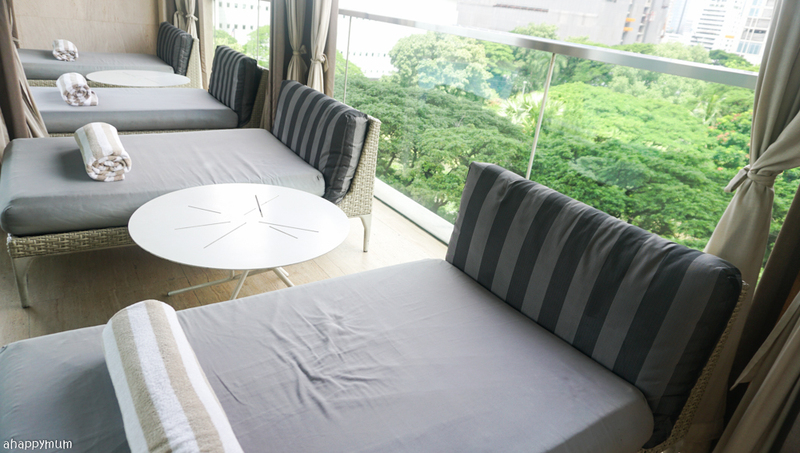 Every of the lounger came with a rolled towel for guests to use and there were also round tables to place your drinks and belongings too. 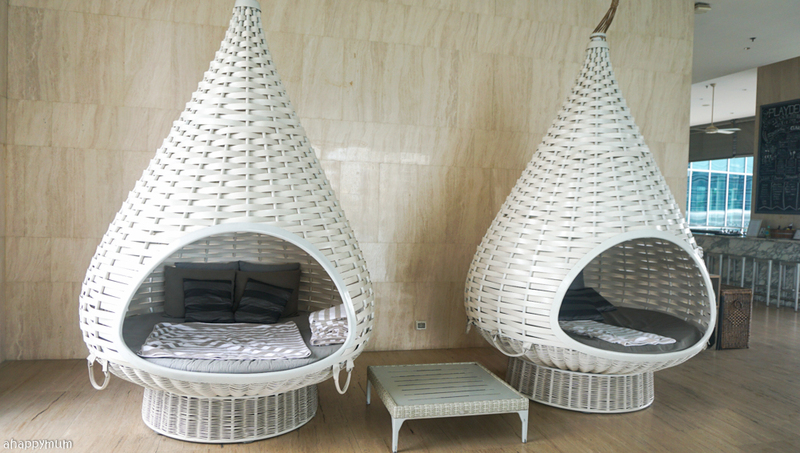 However, what we loved most had to be these.... the woven, teardrop-shaped lounge beds! These were so comfortable to lie in and offered so much privacy that I think I would have been happy to snuggle inside all morning. Haha. It truly felt nice to be with the kids and do nothing much but enjoy each other's presence. And have a cocktail or two. 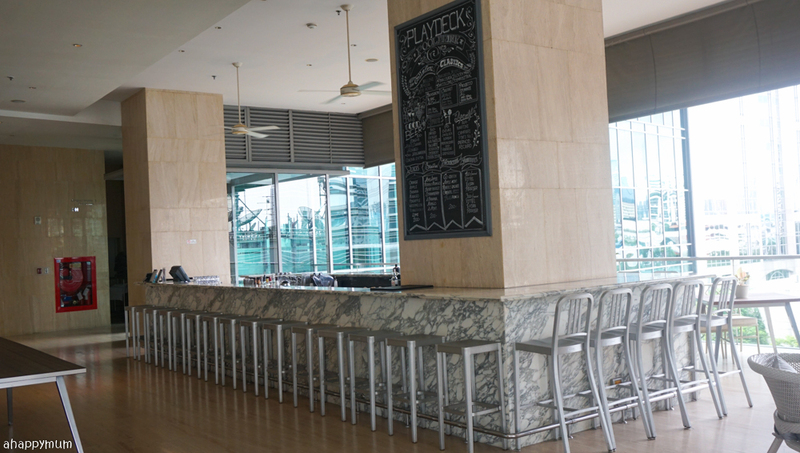 Yup, there is a bar by the pool so you can enjoy some drinks - wine, beer, mocktails, juices, spirits - if you wish to. The hubby had a glass of Chang beer while I was contented with my choice of the Oriental Fizz mocktail. We were thrilled to see a signboard that said "Play room" but turned out to be disappointed when we saw that it had been set up for meetings and there were no toys or kid-friendly amenities whatsoever. 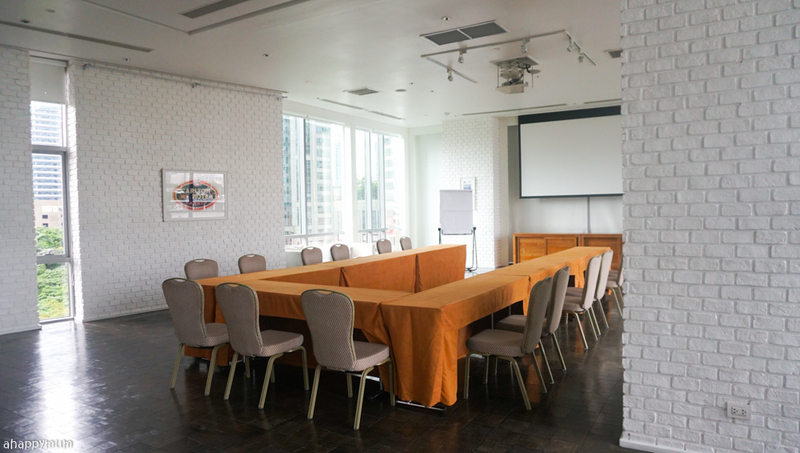 The staff informed me that the room was used for both conferences and parties so it all depends on your timing and luck. 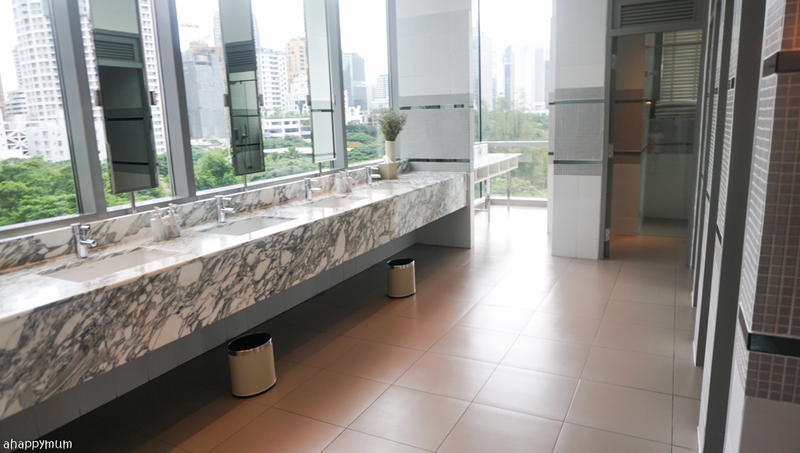 The toilets located at the pool level were also very spacious, offered a splendid view, had marble wash basins and there was also a shower area too for guests who preferred to clean themselves up straight away after a swim. For me, it came in handy because the toddler chose to take a dump just before we jumped into the pool. While the pool might not be huge and the water can be a little freezing, we did enjoy our time immensely, especially since it wasn't too crowded when we were there. 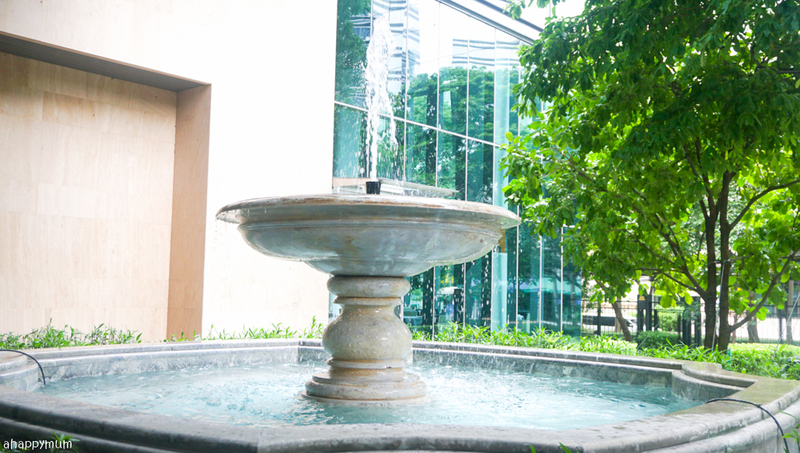 For those with toddlers, there is also a small wading pool at the side for them to splash about. 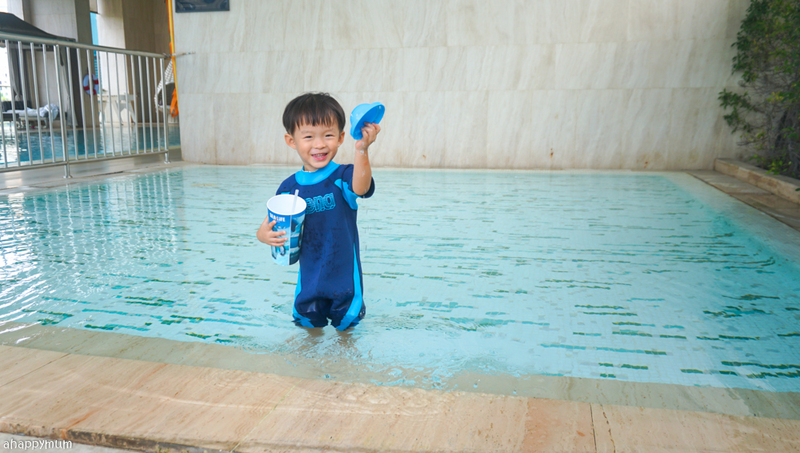 You can bring along your own water toys too to up the fun factor for the little ones. 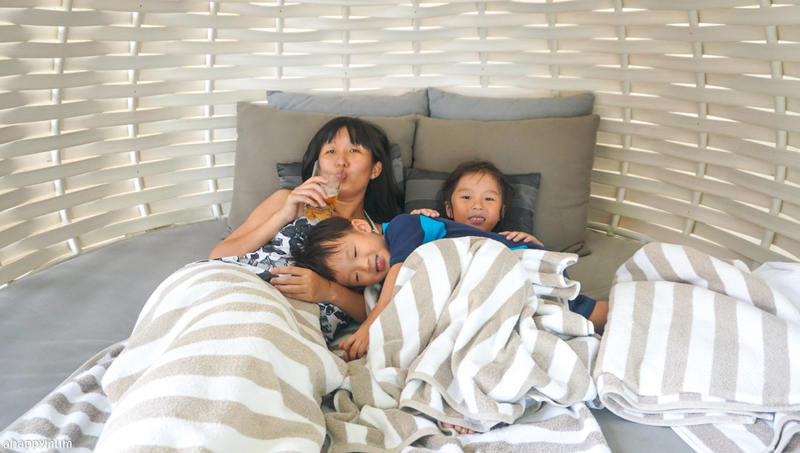 I thoroughly enjoyed my one-one-one time with each of the kids, be it just laying down on the loungers and enjoying the sun, cuddling and sipping on the mocktail or doing piggyback in the water and having a swimming race. Oh, the kids were also very excited to see that there was a table soccer game right beside the pool! They have always loved this game and would have friendly matches with each other. The only thing to take note is that the table is quite high and the rods are a little heavy to turn for the little hands. Also, be careful of the slippery floors as it tends to get quite wet when others walk past. I did see the hotel staff drying the floor every few minutes though, so kudos for the service. 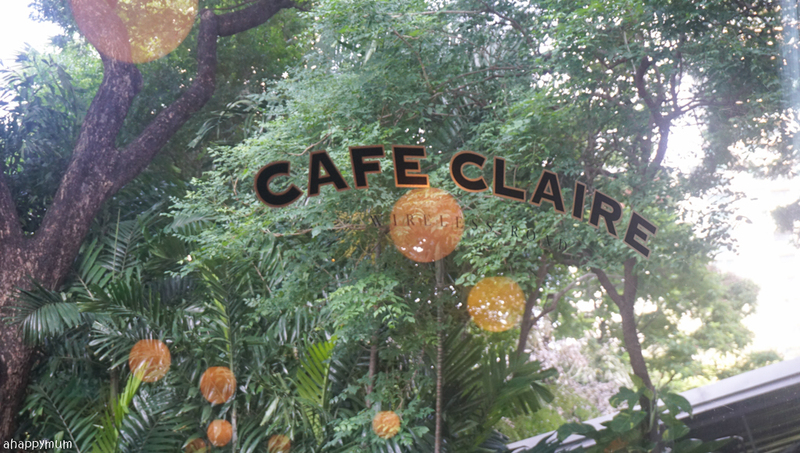 Cafe Claire was where we had our breakfast every morning. 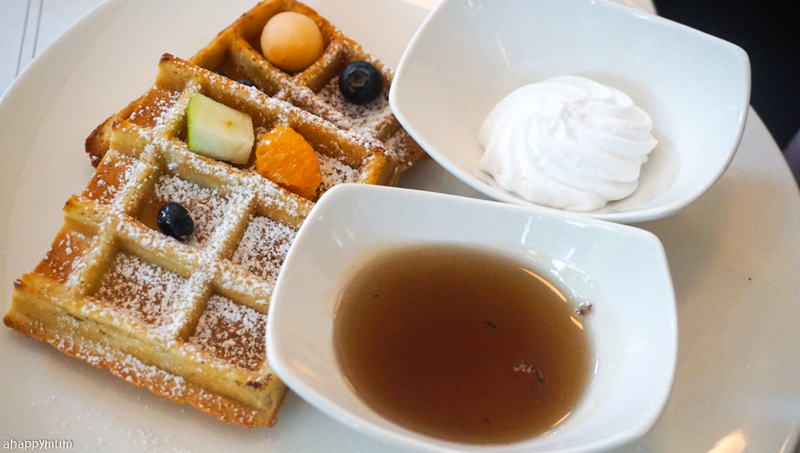 Even though the place is not huge, it is styled like a French bistro and there is something sophisticated about it. 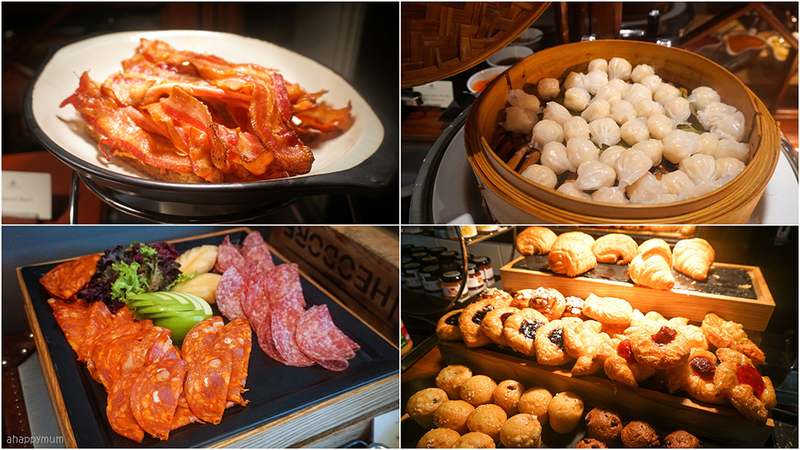 To be frank, I was expecting for a wider variety of offerings but perhaps that is because we've been spoilt by lavish and sumptuously rich breakfasts we've had in places like Shangri-La and Radisson. 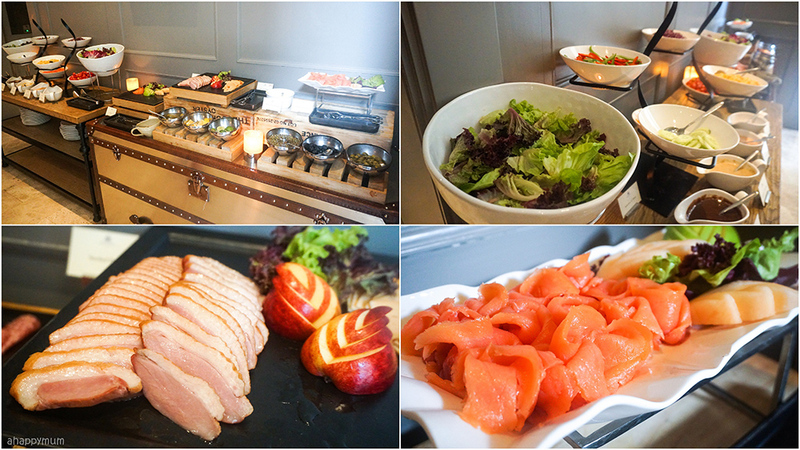 Nonetheless, we enjoyed the smoked salmon, smoked duck, fresh salad, pastry, congee and even wanton soup. 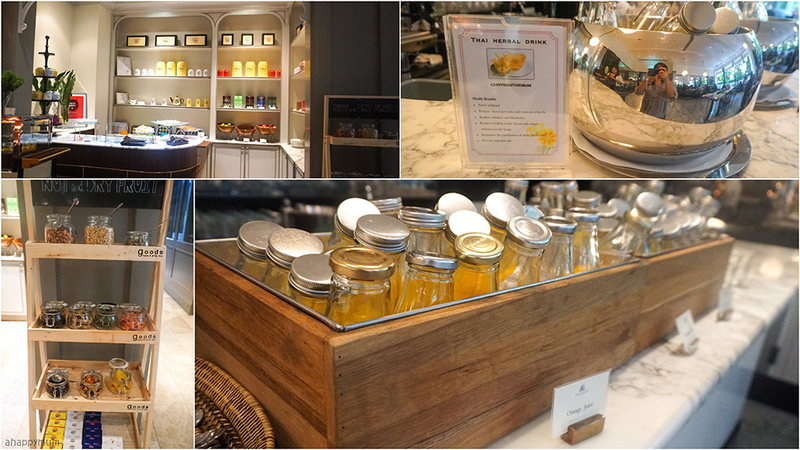 The cold section was one of our favourites and you can find yoghurt, museli and fruit salads in glass jars. 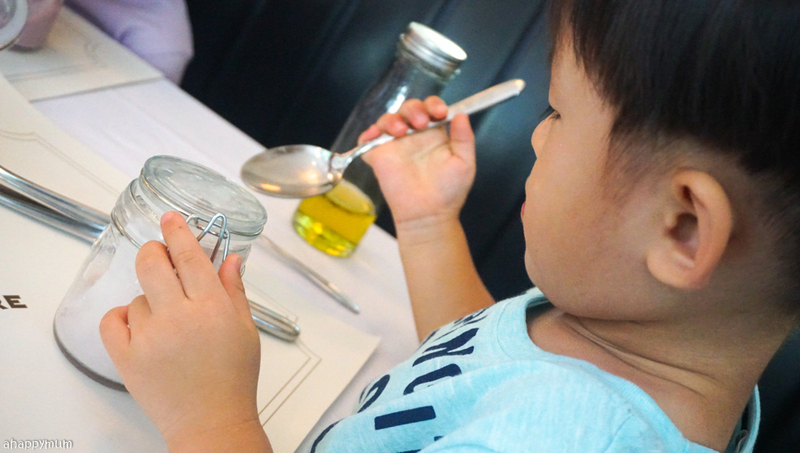 My boy could easily finish a couple of the museli jars because he really loved it so much! By now, you will have realised that you don't usually see anything plastic-ky around here and the same goes for the fruit juices which come in glass bottles with lids. Yup, instead of going for refills, you just take the plastic bottles one by one instead - which makes me realise just how much juice we can finish up in one breakfast session. Thankfully, these were as fresh as you can get and tasted refreshingly good. 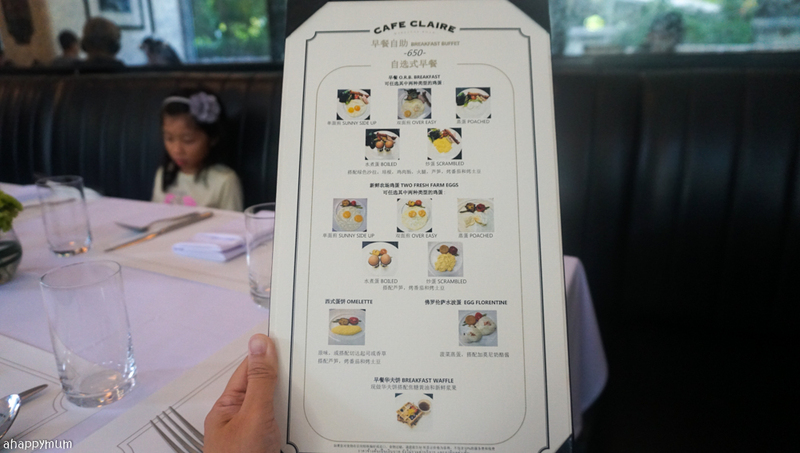 What we loved most about Cafe Claire was the breakfast menu! 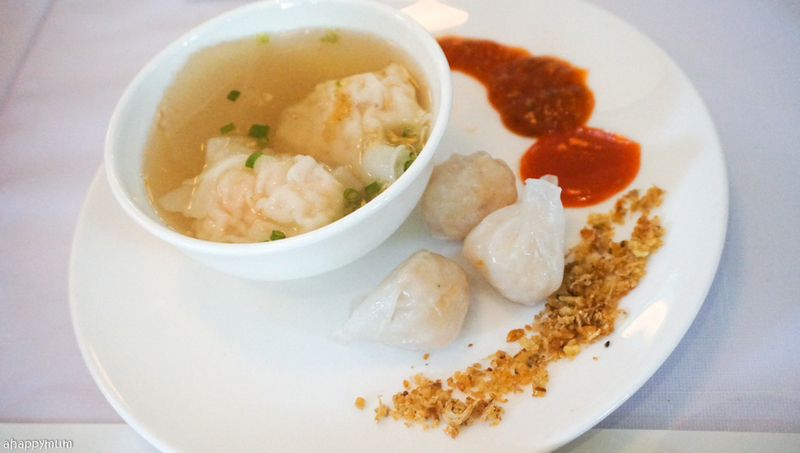 Yup, these were additional items that you can order ala carte. 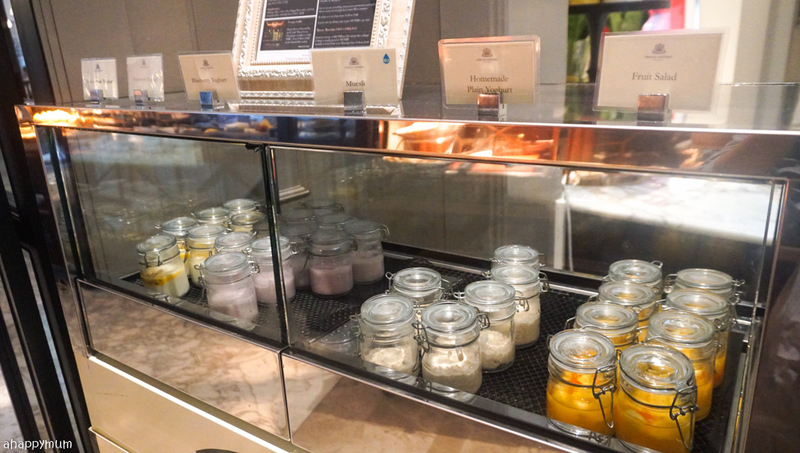 You can choose from the breakfast sets or have them cook your eggs the way you like - sunny side, over easy, poached, boiled or scrambled. My entire family loves eggs so it wasn't a surprise that this was what we loved best. 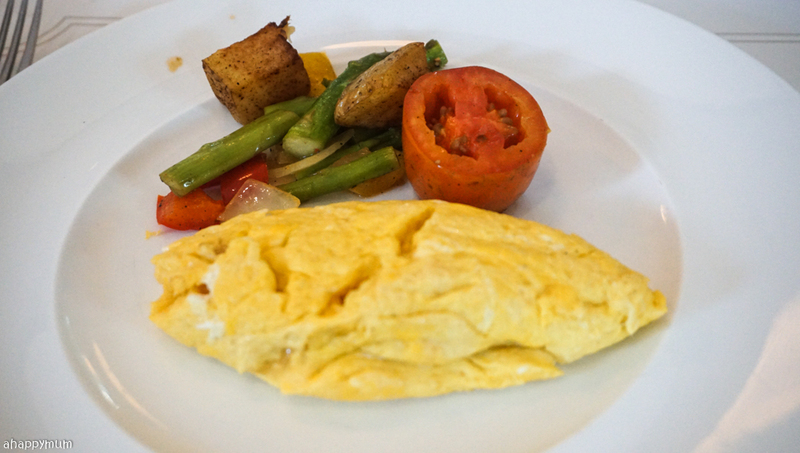 I was happy with my omelette set which came with grilled tomatoes, potatoes and asparagus. 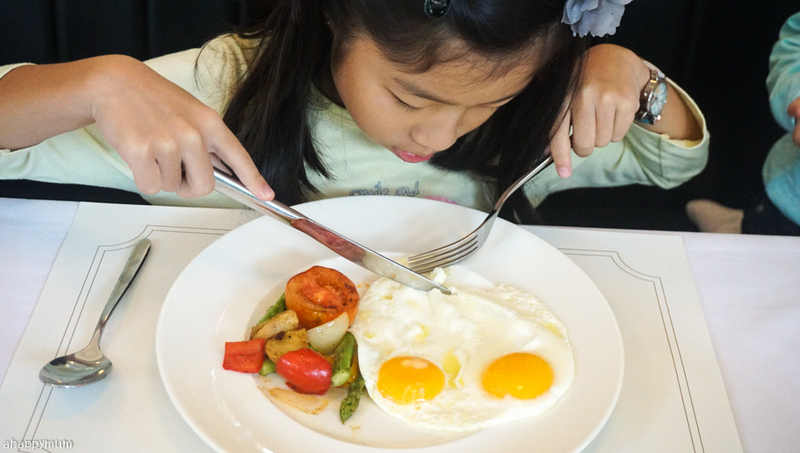 The big girl's favourite was her two sunny side ups which were done perfectly just the way she likes. 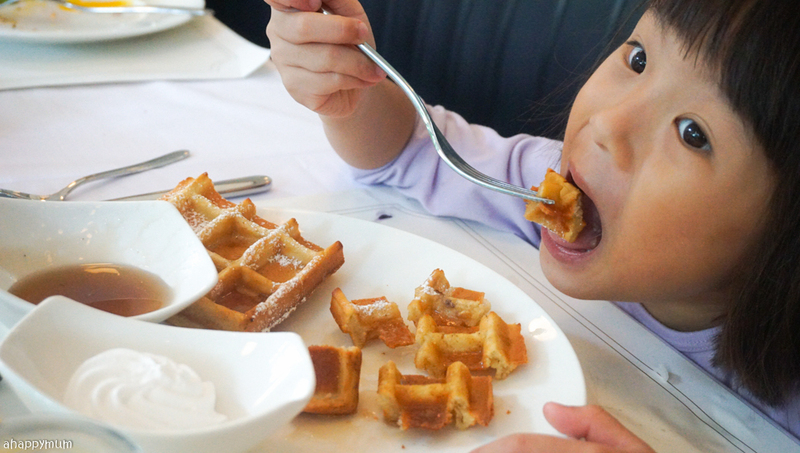 The little sister was most thrilled with the waffles which came with cream, maple syrup and fruits too. 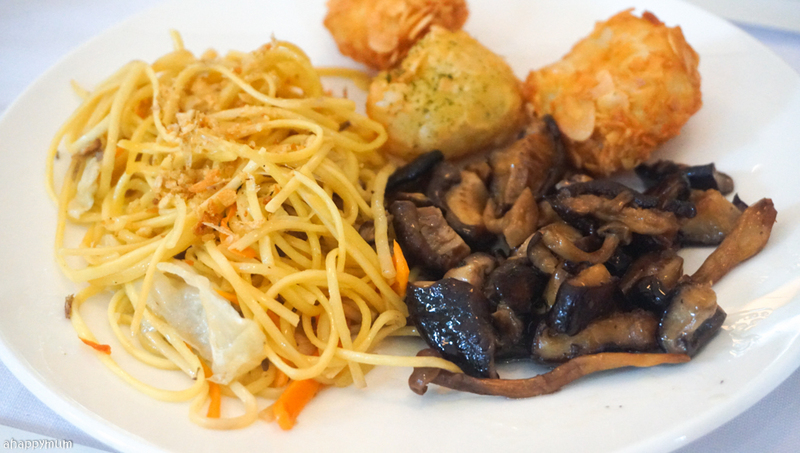 Oh, and if you do happen to come here next time, don't forget to ask for the mini hashbrowns too because they are a delight and we seriously couldn't get enough of them. 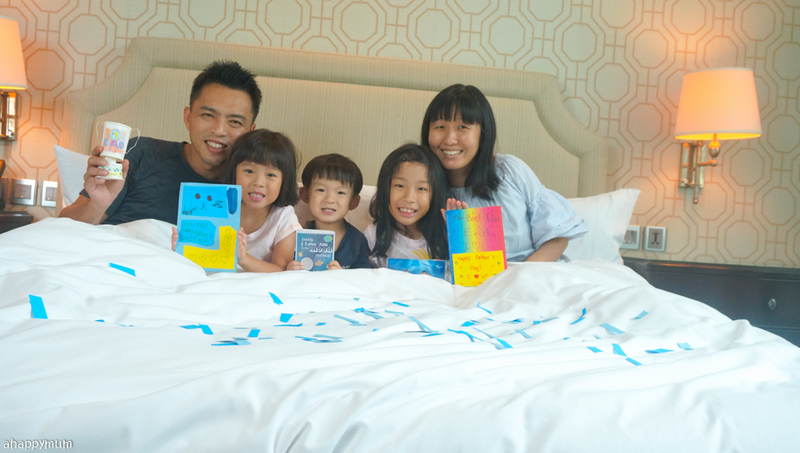 All in all, we had a most relaxing, enjoyable stay and totally enjoyed our family time in Oriental Residence. 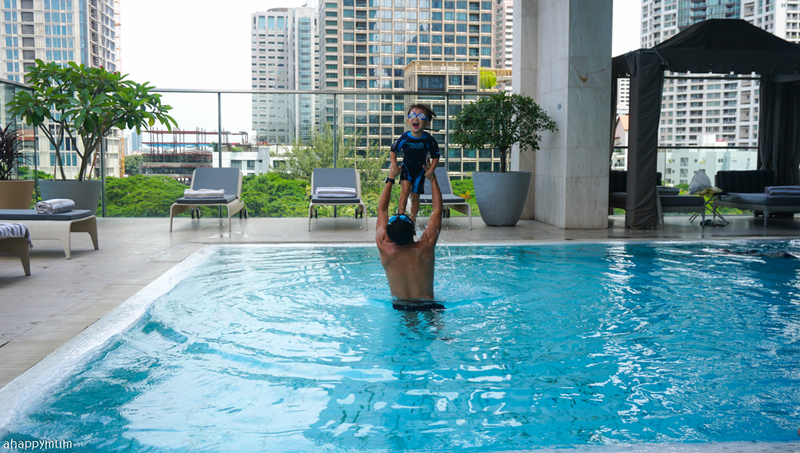 I would definitely consider coming here again on our next visit to Bangkok which has proven itself to be a city that is fun-filled and kid-friendly! 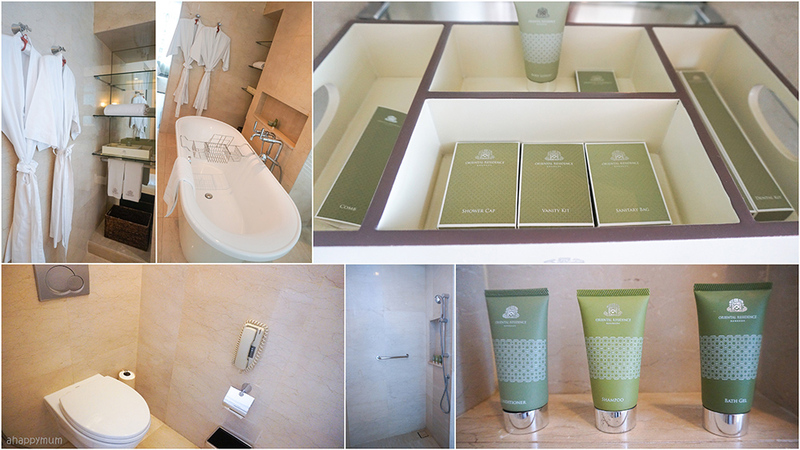 For more information on Oriental Residences, go to www.oriental-residence.com or visit their Facebook page. 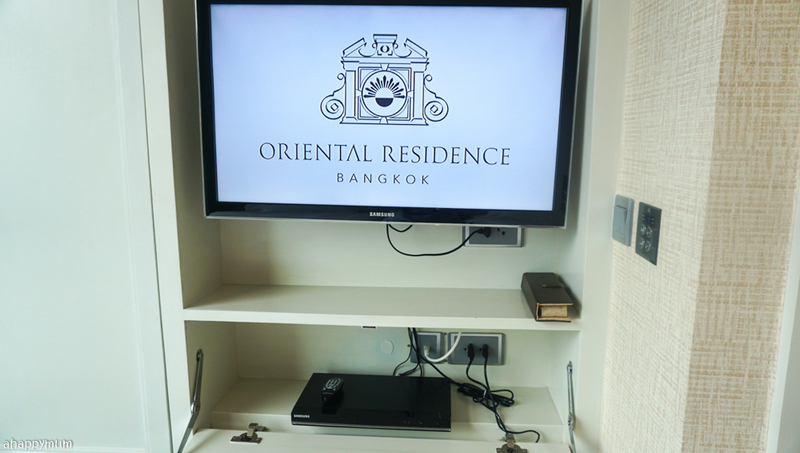 Disclosure: We were hosted for a 3D2N media stay by Oriental Residences in exchange for writing this review. All photos and opinions are purely our own. I'm glad to visit your blog. have been cheerful to cuddle inside throughout the morning. It really felt pleasant to be with the children and do not a lot yet appreciate each other's essence. What's more, have a mixed drink or two.vacation has changed throughout the years. Back in the romance days, were attempting to ration and spare and since occasions typically mean touring in the day and celebrating during the evening.